During his turn, Jiang Wei can use any tool card as an attack. 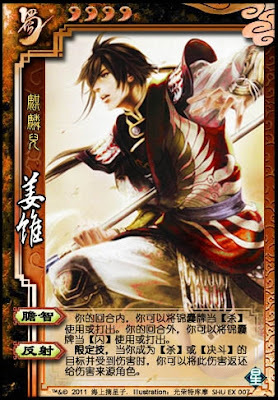 Outside of his turn, Jiang Wei can use any tool card as an escape. When he is targeted and receives damage by an attack or duel, he can flip his character card to give the damage back to the source. If Jiang Wei is already flipped and is damaged by an Attack or Duel, he un-flips to return the damage. When he returns the damage, he is treated as if he were never damaged at all. Jiang Wei is the source of the returned damage. The properties of the damage are preserved when they are returned. This is in both the magnitude and the elemental alignment. If Jiang Wei receives two units of fire damage and returns it, the source then receives two units of fire damage. If Jiang Wei has the Wood Armor, the damage he returns is not boosted. This is because it is only when he is damaged, not receives the damage. There is a subtle difference in the game mechanics. If damage from an attack was passed to him and he was not the original target, he cannot activate "Reflection".